There's nothing like starting summer off right with a batch of fresh squeezed Margaritas. Five easy ingredients = a super simple summer cocktail. Here's my take on the basic Marg with the fresh ingredients we had on hand in Mexico. Get simple syrup started on the stovetop. 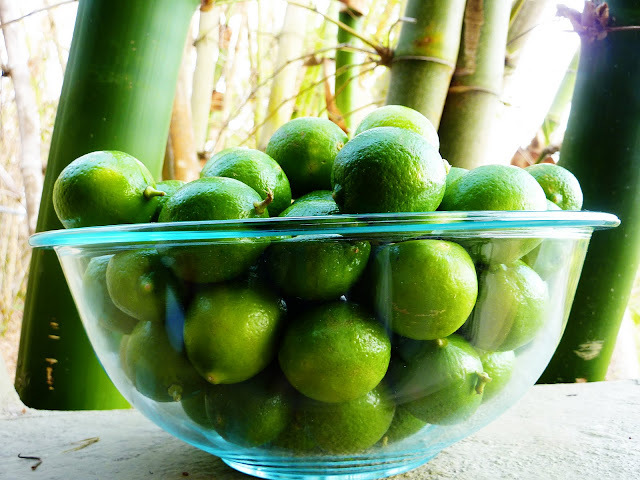 Squeeze the limes. Squeeze the orange juice. Grab a glass pitcher. 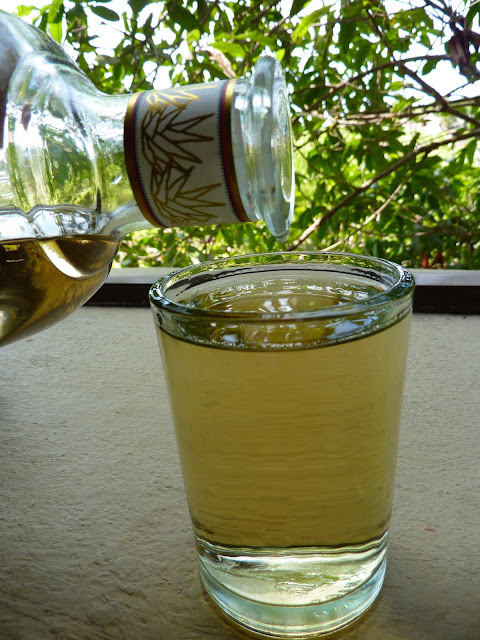 Combine 3/4 cup lime juice, 1/2 cup orange juice, 1/2 cup simple syrup, 2 cups tequila, 1/4 cup rum, and 1 cup water. Stir vigorously. Pour over ice into salt rimed glasses. You're all set to ring in the summer. Cheers! Get a load of fresh key limes. Or regular limes. Either will do. One fresh orange. Slice. Squeeze. Simple syrup. Equal parts water and sugar over the stove. Heat to dissolve the sugar. No need to boil. Yummy tequila. Don't settle for the cheap stuff here. Use your favorite brand. You'll be glad you did. All ingredients ready to go. Tequila. Lime juice. Orange juice. Rum. Simple syrup. I'll say it again. Use your favorite tequila here. Don't settle. My favorite is 30-30 Blanco. But we had an incredible tequila we bought in Mexico here called Cabo Wabo - Reposado. Yes, it's Sammy Hagar's tequila. Yes, it's pretty dang goooooood. Mix it all together in a glass pitcher. Pour it on ice into a salt rimmed glass. Ta-Da! You did it. Fresh squeezed Margaritas. Super easy. Super yummy. Feel the beach my friends. Feel the beach. WOAH!!! That looks insanely good! I don't know if I've ever tasted a margarita with only fresh squeezed juices. This has officially moved to the top of my list of recipes to try this summer.